Sometimes, especially in the winter, they come well before the sun rises. Carpools of families making their way to Ashland and Adams to stand in line waiting for the Mexican Consulate to open at 8am. These are some of the people who brought restaurant owners Pedro Angel and Luis Perea to the neighborhood to open establishments nearby. Angel’s Restaurant occupies an odd structure sandwiched between a two-story office building and a small storefront within two row houses facing Ashland near Jackson Boulevard. The restaurant opened two years ago, when Angel moved his family’s eighteen-year-old business from the Andersonville neighborhood to the West Loop. Angel is proud of his outdoor patio, shaded by trees, adorned with purple petunias and pink geraniums, and set off from the bustle of Ashland Avenue by a colorful fence. This hidden oasis with seating for up to 120 can handle large parties, but with Moretti’s just next door the inviting space is not always used to its full potential. 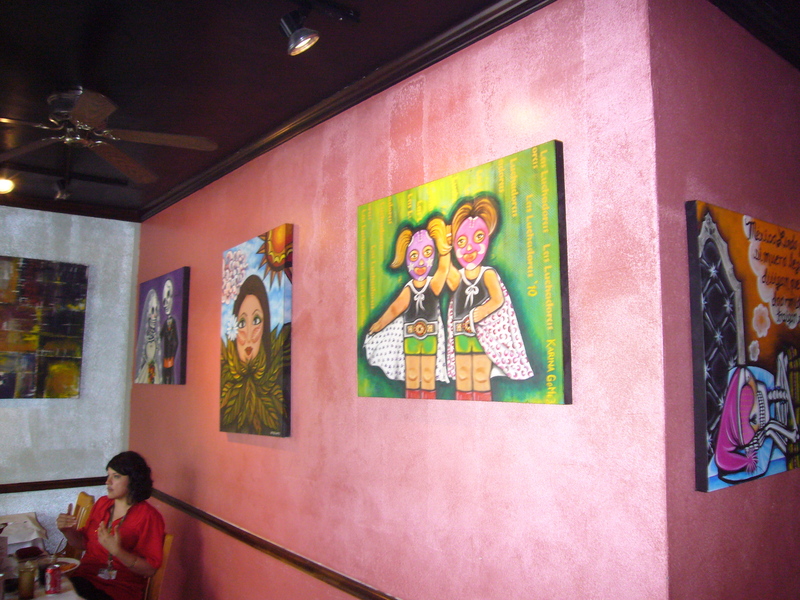 The interior sports vibrant-colored Latin paintings echoed in Angel’s signature dish of molcajete, a succulent meat-based Mexican stew baked in a mortar and served with cheese and vegetables. One block north of Angel’s on Ashland is Luis Perea’s one-year-old project, La Lagartija, a specialty taqueria that features a variety of fresh ingredients, homemade tortillas and authentic Mexican salsa. His new shop is hardly noticeable from the busy Ashland Avenue, which at times feels like a freeway as cars, buses and eighteen-wheelers zip past. Tucked away in the beige brick lofts that dominate the west side of the block, Perea and his team work in a newly renovated facility with sleek aluminum bar stools and chairs (although La Lagartija currently is BYOB), psychedelic lizard designs and flat-screen TVs create a classy yet festive atmosphere for eat-in customers. Perea also brought twenty-two years of experience in the restaurant industry; he attended the Culinary Institute of America in New York, worked for Rick Bayless at Frontera Grill and as sous chef at Topolobampo before leaving ten years ago to open his sandwich shop and bakery, Bombon Café, with his wife Laura, a fellow protégé of Bayless. Bombon Café on Monroe and Ashland is the Perea’s second shop by that name, and completes the community of eateries on these short blocks of Ashland. Farther south past the Rush Medical Center is the Pilsen neighborhood, where the Pereas started their business before expanding to the West Loop. 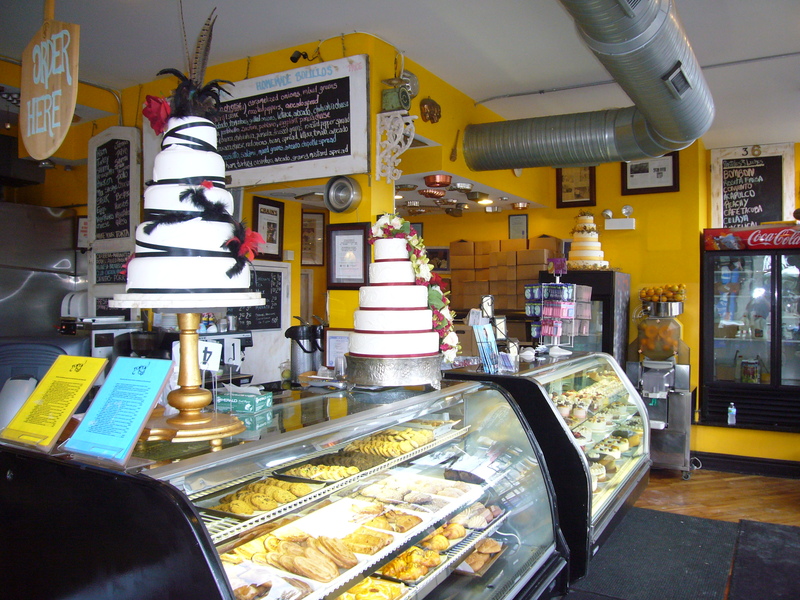 Now they keep a quaint shop just west of Ashland on 18th Street as a gallery for their elaborate cakes and pastries, and Angel’s and La Lagartija are attracting new and loyal customers from the Pilsen area and beyond. It has been more than nine years since the Mexican Consulate opened its doors. The consulate brings daily traffic to this small stretch of Ashland Avenue with appetites and a natural affinity for the new restaurants nearby, but it remains to be seen whether this nucleus will draw other new businesses to this stretch of Ashland that divides the Near West from the West Side of Chicago. Three nearby storefronts now have “for lease” or “for rent” signs in their windows, but this mini-ecosystem may have reached its carrying capacity for restaurants.